Landfills produce large amounts of certain greenhouse gases every year. When left uncollected, these gases are devastating to the environment, climate and earth as a whole, contributing to atmospheric smog and ozone depletion. Morrow LFG treatment plants collect this gas, composed mostly of methane and carbon dioxide, and treat it to pipeline specifications as a renewable energy source. This provides a long-term profitable resource for landfill owners. Morrow Renewables work with landfill owners, operators, and waste management companies to turn the liability of landfill gas into a renewable environmental asset. Landfills produce large amounts of greenhouse gases every year and when left uncollected, these gases are devastating to the environment, climate, and earth as a whole. For landfill owners, the required flaring of these harmful gases often demands capital outlay, while providing absolutely no return on investment once LFG is eliminated. When LFG is properly treated, it can be repurposed as a profitable, long-term source of renewable energy and reduce compliance risk for landfills. Methane is a greenhouse gas with a lifetime of twelve years in our atmosphere, and twenty-one times the global warming potential of carbon dioxide. Forty percent of methane emissions in our atmosphere originate from natural sources, such as wetlands, oceans and hydrates. Human activity, alarmingly, accounts for the remaining sixty percent of the world’s methane production, and the majority of human-induced methane can be traced to one area: landfills. Why use High-BTU LFG Treatment? If LFG is treated to high-BTU specifications, it consists of about 95% or greater methane, 1-3% nitrogen and 1-2% carbon dioxide. All contaminants and volatile organic compounds (VOCs) have been removed and incinerated. 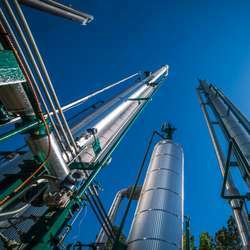 From there, the gas can be sold into a natural gas pipeline, offsetting the world’s shrinking fossil fuel reserves, while almost completely eliminating the environmental consequences of solid waste decomposition. Instead of maintaining and operating equipment to flare LFG, a few different procedures make it possible to harness the energy potential of landfill gas for profit: electric power generation, development of medium-BTU industrial fuels, and injection of high-BTU gas into utility company pipelines. We believe the LFG-to-pipeline production model is the best solution for most landfills managing a quarter-million tons of waste or more each year, particularly in areas where the difference between the cost of fuel to produce electricity and the price of that same unit of electricity (known as the spark spread) is considered low. A high-BTU gas project is likely more viable in these areas than a power plant. See Morrow’s Website for more information!